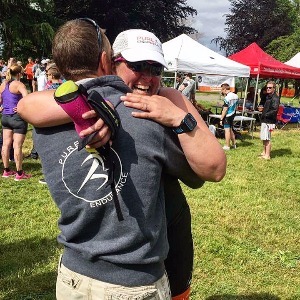 As the head coach at Pure Endurance I pride myself on helping my athletes find a balance in life that includes family, work, social commitments, training, and racing. I have found that a "perfect training plan" is one that leaves time for the individual to have a thriving life outside of sport as well. Being that I coach mostly working professionals who have an already full plate, I seek to balance the training stress on a week to week basis so that they can be active for the long term. I started in the sport of triathlon as a youngster at the age of 9 or 10, I can remember the anxiety of race morning like it was yesterday. Fast forward 30 years and I now get to experience the same race anxiety as I watch my coached athletes toe the line on race morning, and on occasion where I suit up and get out there to lay it down. I have to say that while I love going hard on training sessions and occasional races I love the opportunity to watch my athletes perform on race day. The expressions that i get to see as they cross the line, many times with a new personal best time are some of the best feelings in the world and I am fortunate to be able to be a part of their journey. Having the opportunity to coach multi-sport and endurance athletes for the past 4 seasons I have come to understand that there is no one size fits all or even most approach. That is why I take the time to listen to each athlete and treat them as an individual when it comes to their training, goals and events. Having recently turned 40 I have hired a coach for myself and am preparing to race "Honu" Hawaii 70.3 on June 2nd 2018. Athletes must have a device that can upload to Training Peaks metrics such as HR, pace, duration, cadence, distance. For cyclist and triathletes a power meter is strongly encouraged. Success. Coach Jon Booth has been notified of your message. To hire Jon Booth as your coach, select the coaching service that is right for you.